Wood borers (Powder Post Beetles) are tiny beetles whose larvae feed extensively on the wood. The wood worms while emerging make tiny pin size holes on the surface of wooden furniture or fixture. Those tiny holes which you see on wood surface are actually the exit -holes where the adult wood borer has left. Here at Rajashree Pest Control we provide an Integrated wood protector service which helps to increase the life of your expensive wooden articles. The fine yellowish colored powder (Yellow Dust) starts appearing from these tiny holes. This indicates the destructive activity of borers deep inside the core of the wood as these are internal feeders. They feed on the cell contents of the sap wood. While feeding they make tunnels and pupate within the wood. Borers or Powder Post Beetles attack partially or fully seasoned wood with 10-15% moisture. The exit holes are very small, about the size of a pin head. When the wood is tapped with a hammer dust will fall from these exit holes. 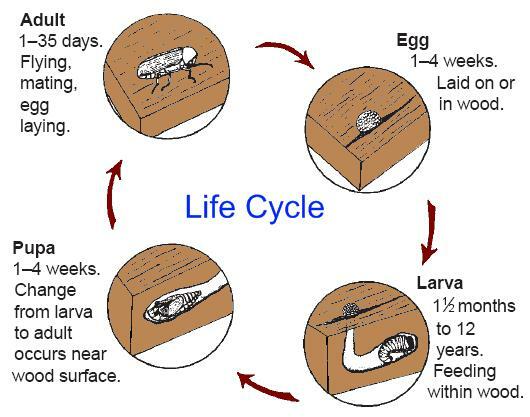 Prevention: Most beetle problems are introduced into homes in lumber or finished wood products (e.g., furniture, paneling, or flooring). Most serious infestations occur when infested wood is installed in the house. Inspect wood to insure that wood is not infested at the time of home construction, wood finishes. Powder post beetles only lay eggs on bare, unfinished wood. Beetles will not infest wood that is painted, varnished, waxed, or similarly sealed. Beetles emerging from painted or varnished wood were either in the wood before finishing or were a result of re infestation by eggs that were laid in emergence holes of adult beetles. 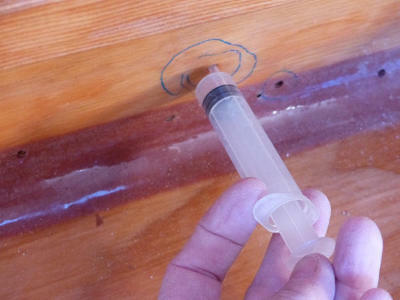 Sealing holes prevents re infestation from eggs laid within the hole.